Mananeeya Eknathji says Anushasan in one's life brings total harmony. This harmony in one's life alone helps one to understand his relations with the people in society and that is the crux of social work. Success is sure when there is complete harmony in the Sadhaka, Sadhya and Sadhana. When this stage is reached, the world does not become monotony. Every act, every individual and everything around you becomes meaningful. Things acquire a new charm. A third-rate meal, which you would not have accepted previously, becomes purposeful, because, there the taste of the tongue becomes subservient to the requirement of the fuel for the belly, as it preserves and provides the energy for the next activity in the achievement of the aim. 'Sleep anywhere and anyhow' becomes the happiest thing as it makes one fresh and energizes one for the work of the morrow.The struggle disappears and one is at peace with one's work and also with the world. One has to shape one's life for the mission. There is nothing impossible in the world. As the Hindi proverb says, "Nara karani kare so naraka Narayana ban jaye." "If a man acts properly, he may become divinity". But one has to strive hard for this and the full price has to be paid. There is no short cut for this. One has to change his nature and his habits if they are detrimental to the objective. One has to impose rigorous discipline on his own self. If one desires to have any concession one should feel abashed, as it will reveal that he does not desire to pay the full price. It is unworthy of a man of principles, who is aspiring for a mission in life. Therefore, transform yourself and let your life become a Sadhana. The Anushasan, as Eknathji places to all karyakartas, he gives different dimensions of it. After seeing Yama, Niyama and how in different arts and science, a person should have inner discipline. He now says : Consistency in one's mission and social activities and personal behavior is essential. There must be consistency in life and merely toying with the ideas and ideals does not help. There must exist a correspondence in one's mission and his social activities as well as personal behaviour. Now this needs further disciplining of oneslef. Eknathji says : One's nature must obey the strict governance of the mission and his mental and emotional state must be tuned to harmonize with the aspirations. Many people talk of high things, but their behaviour is too low, because there is no discipline. Mind aspires but body rejects. All the physical equipments must respond to the call of the mind. The higher the aspiration, the more rigorous is the life. Mere austerity does not help. If one is neither dynamic nor static, he hangs in between like Trishanku who could neither go to heaven nor come down to the earth. Thus one loses the worldly life and does not achieve the goal. His life is described in one Sanskrit saying "Idam cha nasti, param na labhyate." "This is not for him and the other one he does not acquire." The story of Trishanku is told in the Bala Kanda portion of the Valmiki Ramayana. Born Satyavrata to King Prithu in the Solar Dynasty, he was an ancestor of Lord Rama. As he grew old, Satyavrata crowned his son Harishchandra whom he seated on the throne of Ayodhya, renouncing his royalty. Since he had lived a righteous life, Satyavrata's soul deserved ascension to the heavens, but he wished to do so with his mortal body and requested his Guru Vasishta to perform the needful rites to achieve this goal. Vasishta refused to perform the rituals and advised the former king that his wish is against the laws of nature and a mortal being may not enter the heavens with his physical body. Satyavrata was adamant and upon this refusal, approached Vasishta's eldest son Shakti to help him, attempting to lure the young sage with promises of wealth and fame. Satyavrata's attempt to position Shakti as his father's rival for a task previously refused by the sage, angered the son of Vasishta and he cursed Satyavrata, turning him into Trishanku, leaving him with a horrific form and debilitating afflictions. Trishanku was forced to leave his country and wander the wilderness. During his wanderings, Trishanku met sage Vishwamitra and appealed to him for succor. Upon hearing the plight of the king, Vishwamithra, who had an intense rivalry of Vasishta, accepted Trishanku's request and agreed to perform the necessary rites to raise Trishanku to the heavens with his physical body. The yagnas (rituals) began and with the ascetic powers of the sage, the former King Trishanku started ascending to heaven. Upon his arrival in heaven, the Devas were alarmed by this unnatural occurrence. Led by Indra, they refused to permit Trishanku to enter, and tossed him out. Trishanku began falling back to earth. The furious Vishwamitra would not accept defeat at the hands of Indra. The sage used his powers to arrest Trishanku's fall, causing the latter to be suspended mid-air upside-down. Trishanku begged Vishwamitra for help and the sage once again used his powers, this time beginning the creation of a parallel heaven in a portion of the southern sky. As the new heaven was built, the sage raised Trishanku to it and restored him to his former state before being cursed. Vishwamitra then began establishing Trishanku as the Indra of the new heaven that he had created. This alarmed the Devas who then appeared before the sage and tried to console him and withdraw him from his act. They explained to Vishwamithra, their actions and how they wished to prevent the unnatural act of someone with a mortal body entering the heaven. Vishwamitra was gradually convinced but now he faced the dilemma of having to break his own word that he gave to Trishanku about sending him to heaven. Vishwamitra reached a compromise with the Devas to let the King inhabit the new heaven that was created for him. The new heaven shall be called Trishanku's heaven and the king shall reside in this heaven from now on. He shall not supersede the command of Indra by ruling his own heaven, and to ensure that, the king shall reside upside down in his heaven. Thus is the story of Trishanku who is suspended in his own heaven as a compromise between earth that he belonged to and the heaven that he sought. Eknathji therefore advises : Transform yourself by being a true Sadhaka whereby life becomes a Sadhana for the achievement of Sadhya. "Yama defines our interactions with others (Including nature) and, therefore, it is traditionally considered that practice of Yama is the most important. Without the practice of Yama, practice of other limbs of Yoga would not be fruitful. Thus Yama is the 'pre-requisite' fundamental for the practice of Yoga." 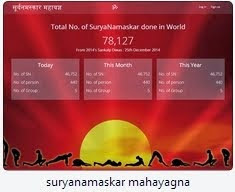 The website has been started on Rashtra Chintan Diwas, a First day of Samartha Bharat Parva, and till now 12,83,190 Suryanamskars have been registered. Ishvarpranidhana helps in reducing the ego and helps us, to be a harmonious part of a team and to work in a team. Thus a real practitioner of Yoga is a good team-member as his/her 'I' is absent. By practice of Ishwarpranidhana, one attains Samadhi, Self realization, realization of Oneness. 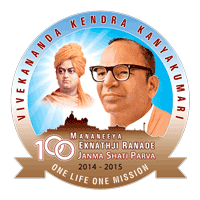 Mananeeya Eknathji wanted each of the Karyakarta to understand all these Yamas and Niyamas which are very essential for the Anushasana that one needs to have in oneself and also while working in society. It would create lot of stress in the beginning as the one who has fixed his goal would find it difficult to practice. But Purity, Patience & Perseverance alone works and so devotedly working would be needed. Swadhyaya means self-study. It means to do regular Japa of our Ishta Devata and to have regular study. Regular study of such books that sharpen the intellect and enhance capacity such as Viveka or discrimination about what is permanent and what is temporary. This in turn will help understand subtleties of situations and subjects thus helping either directly or indirectly in Atmadarshan. While looking into Spiritual and Mundane, this has been already referred. The Viveka is a must in deciphering it properly. Swadhyay develops that Viveka. Swadhyaya traditionally means Study of the Shaastras. This gives us a scale to evaluate our progress; otherwise we tend to justify our impulsive actions with our own logic. The test of Dharma of what is right or not is determined by the Shaastras. Regular study of the Shaastras is essential. Since we have several Shaastras; a question may come to mind as to which ones to read. Many times when we read the Shaastras, the Sutra form or archaic language is difficult for us to understand and thus we have to take the assistance of some commentaries. For today's complexities and in modern scientific terms, Swami Vivekananda is one of those few persons who have explained Vedanta very lucidly by synthesising various philosophies. 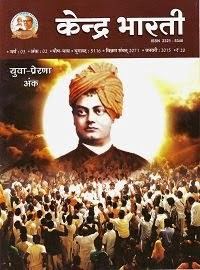 Thus we can get the essence of our Shaastras in today's language in the Complete Works of Swami Vivekananda. Viveka develops through regular study and the Japa of our Ishta Devata helps us in realisation of Ishta Devata. Niyamas help us in purification of anthakaran. Tapas is utmost needed in every walk of life. With Tapas alone one can achieve whatever one wishes.  Physical Tapa – Worship of Gods-Goddesses and respect for elders and the learned, cleanliness of body, Straightforwardness, Ahimsa and Brahmacharya.  Tapa of Speech: speech that is without irritation, truthful, endearing, beneficial and also speech that reflects study and practice.  Tapa of Mind: Pleasant, gentle, non-reactive, with self-control and a positive perspective of everyone and everything.  The literal meaning of Tapa is to heat. The heating of and striving for purification of body, mind and speech should be consistently practised. Only then can the impurities be removed. It is also very important for living in harmony with Samashti, for the service of the society.  Tapa in simple terms would mean readiness to undergo pain to develop body, mind and intellect. Unless the body, mind and intellect are subjected to discipline these would not develop capability to undergo the rigours of the Yoga way of life. For example muscles develop only when subjected to the pain of stretching and weight-lifting and not allowed to be in comfort. For self-development, Tapa has become essential in today's life of comfort and over-indulgence. Complete practice of Tapa or penance destroys impurity and enhances the powers of the organs and body and mind. Niyamas help us in purification of anthakaran. Santosh means Contentment in whatever means one has and to use it optimally. Many a time a person wastes his life by thinking he does not have something or the other. Thus whatever is available even that is not put to good use. Practice of Santosh is to 'start from where you are and what you have'. As and when required Providence gives us all that is needed. Thus Eknathji brings the concept of faith in God and simple living to the Karyakartas. Consumerism, apart from depleting natural resources, distracts the mind. Practice of contentment alone can check the rising tide of consumerism. Not to be dependent on means of comfort or status and objects of enjoyment for living life. When everything is the expression of one's own self how is it possible to feel one lacks something? That non-dependence on materials or persons is to be practiced. A smiling face, acceptance of the fruits of action as Prasad, to continue doing what we are supposed to do even if fruits of our endeavours are not in sight. Eknathji also places the Dhriti-Utsav samanvita aspect through Santosh. 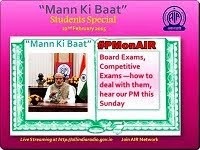 Not getting affected by adverse situation, even if no immediate result of the work done is seen. Contentedly to pursue the service of the Samashti, and practice for expansion of consciousness, is in short the practice of Yoga way of Life which is the very basic of our nation, culture. Most often discontentment is not amongst those who have modest means but amongst those who have plenty. The tendency is to look at those who have much more and get restless to acquire it. Thus there is no end to demands, hankerings and ultimately, life is wasted in acquiring the means of enjoyment but the joy of life and that of living is lost. Life is wasted only in chasing for means and in the process the goal of life, the purpose of human life is lost. Over-consumption of the modern man has emerged as a threat to the survival of nature. Since man is a part of nature even his survival is at crossroads. Practice of Santosh does not mean that we merely stay where we are and cease all striving for improvement, refinement. Not to grieve over what we do not have but to strive with Shraddha and joy for achieving it with full contentment in mind for what we have is to be understood. One who is established in the practice of Santosh gets superlative happiness. As each and every moment is full of contentment, happiness is discovered in the 'here and now'. Niyamas are important to discipline us and prepare ourselves for higher sadhana of Bharatmata through our work. Eknathji therefore gives much more important on all these aspects through Anushasan. Niyama is for self-preparation, for self-development, and are related to oneself, one's attitudes. Thus Yama defines our interaction with Samashti and Niyama defines our approach to one's own self. Eknathji prescribes three vows for Jeevanvratis and in that Shuchita is one. What is Shuchita? Internal and external purification, to keep body clean and mind pure. A dirty, unkempt person cannot be a practitioner of Yoga. Take care of the food intake -not only what we eat but also the food of the other senses such as ear, nose, eyes and skin. The internal impurities are Rajatamomulak Vrittis – such as kama -passions, krodha -anger, lobha -greed, moha-delusion, temptations, mada -conceit, matsara -jealousy, dambha -hypocrisy, asuya -envy, irshya - competition, ahamkar -ego, harsh speech, ignorance, inertia, untimely sleep, etc. One should get rid of these internal impurities. These internal impurities are to be removed by thinking of contrary thoughts (Vitarkabadhane Pratipaksha Bhavanam –Sadhana Pada' Sutra 33) For example, if we feel jealous of someone then we should dwell on appreciating his/ her qualities. Practice of Shaucha develops disinterestedness for one's body and for contact with other's body, cheerfulness, concentration, self control and fitness for the realisation of the Self. Aparigraha means to have only that which is needed for the protection, development and nurturing of the body, mind and intellect. To keep with oneself what is not necessary actually depletes the society and nature. When one practices for the realisation of Oneness, it is important that his or her behaviour should be aligned with the sustainability of Samashti and Srishti. Thus practice of Aparigraha means non-gathering of things not absolutely essential for a person. It is not just things but persons even get cluttered with the past happenings, opinions, etc which is again a great hindrance in quietening of the mind. Moreover, one gathers more things thinking happiness lies in it. But seeking happiness in materials is detrimental to the practice of Yoga. Mind also gets cluttered with many thoughts of acquisition and keeping these things with oneself which is not congenial for the practice of Yoga. The one who is established in Aparigraha gets the knowledge about past and future births, one also gets the knowledge of how to live life. These laws are universal and therefore, are to be followed by taking time, place, purpose into account so that oneness is protected. Other Angas cannot be practiced all the time for example Asana or Pranayama or Samadhi but Yama needs to be practiced always and by all. These five Yama should be practiced by all, every woman, man, child irrespective of time, place, age, community, nation, and position. 5. Guhyabhashan – Until now very safely with double meaning the words were used but if the other person tolerates or even accepts it then the person starts talking such things which could be talked only in seclusion and not in front of others. Even the dullest person can understand the intentions at this stage and can put full-stop to the advances. But if that is also not done then the complete fall from Brahmacharya Vrata becomes imminent. 8. Kriyanivritti - the person enters into an immoral relationship. Today unfortunately it has become a practice to justify such relationships through TV serials, cinemas, etc. as so-called 'forward' behaviour. Any kind of self control is termed as 'backward'. But such immoral relationships destroy the family system. The atmosphere for the practice of Yoga in society degenerates and of course that person becomes unfit for the practice of Yoga. By regular self-analysis and self-introspection one should control the fall before it gathers unmanageable acceleration. The practice of Brahmacharya is not barred for married persons. With certain rules of behaviour even his/her married life is considered as a practice of Brahmacharya. Such parents who practice Brahmacharya can give birth to very elevated children and can really bring up their children in a much better way. This was called as Adhijajananashastra in our culture. The practitioner of Brahmacharya gets the required energy and enthusiasm for the deeper practice of yoga. Your latest letter dated 7-11-1979 has been duly received. It is good that you have started learning type-writing and practicing scooter-riding. This will no doubt help you considerably in managing your own official correspondence as also attending to your outdoor engagements without being required to depend upon the public transport. The phenomenon that your body has not yet got attuned to the Calcutta climate is really somewhat strange, especially when it is now over a month that you have moved to that place. Moreover, except that the climate of Assam, your erstwhile filed of work, is a little more humid than that of Calcutta, your present place of positing, there is not much climatic difference between the two. You may, therefore, consult a doctor to seek guidelines from him regarding the things to be specifically avoided in your diet as well as regarding other such precautions to keep off ailments like nose-bleeding, fever, bodyache, etc. to which your body may have become susceptible after you came to Calcutta. I am not a psycho-therapist. But basing my diagnosis on whatever experience I have gathered while dealing with human material all these years, I have a feeling that your physical malady may have originated mainly from your present mental condition. It may be that your mind has not wholly accompanied you to your new place of assignment and a part of it may have been left by you to hover over North Lakhimpur although our life-workers, as per our norms, are expected to move to their place of transfer, lock, stock and barrel or, to put it more precisely, heart, mind and body. You may check up with yourself to ascertain the correctness of my diagnosis. You may be able to do so just by (i) counting the number of your communications sent in your old field of work (ii) bringing before your eyes the persons whom you addressed your communications and (iii) the subject-matters of communications. If after such a scrutiny, if you also feel that there is some validity in my diagnosis, you should take adequate remedial measures. The first step that you should take as a remedial measure is to stop forthwith all non-official correspondence with people at North Lakhimpur. We life-workers are expected to be like rolling stones that do not gather any moss of personal attachment or involvement. While we go to Ganges, people there should soon feel like naming us Ganga Vishnu or Ganga Prasad and while you go to Narmada, we should take no time in qualifying ourselves to be called Narmada Shankar or Narmada Prasad by those of that region. I hope by the time you meet me at Madras, you would have restored back your health, both menal and physical. What is firm centre of your life?